By the time a woman reaches the age of 35, she tends to know what works and what doesn’t when it comes to her hair and beauty regime. You’ve tried the bargain basement products and while they are kinder to your wallet, they don’t make your skin or hair feel the way you like. Not to say that expensive always equals the best, but very rarely will the cheapest product on the market do the best job. So when it comes to thinning hair, why change the approach you take when it comes to choosing say your facial cleanser, foundation or shampoo? The quality of the ingredients in hair thinning treatments does vary and this will affect the results you see. A hair specialist will be able to diagnose the condition and explain what is causing it. It is usually possible to treat the hair with a product called Minoxidil, the only product that has successfully undergone clinical trials and been shown to be safe and effective for treating female hair loss. But just as there are numerous types of cleansers, foundations and shampoos, so too there are different Minoxidil formulas. Belgravia offers a number of different formulations of high strength minoxidil for women, and you can find out more about these by contacting the centre. Some forms of minoxidil can include added ingredients such as Medroxyprogesterone (MPG) or Azelaic Acid (AA). MPG is an unproven product that may help to prevent dihydrotestosterone (or ‘DHT’ – which is the product in the body that causes genetic hair loss) from attacking the hair follicles. This complements Minoxidil’s effect on the follicles, and may improve the results. When MPG is added to Minoxidil it becomes a prescription-only treatment. AA may help to reduce the amount of DHT reaching the hair follicles by inhibiting the formation of 5-alpha reductase, the enzyme that combines with testosterone to produce DHT. While it is an unproven product, when added to minoxidil, it creates a unique, prescription-only treatment that can treat stubborn patches of hair loss. 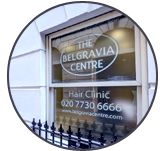 Belgravia’s clients have achieved great results using various minoxidil formulations alongside a range of Hair Growth Boosters. 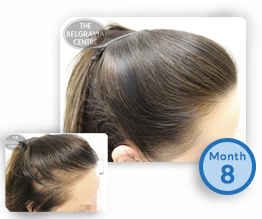 The regrowth they have experienced can be seen by visiting our Hair Loss Success Stories.